HANOI — Human Rights Watch on Tuesday called on Vietnam to investigate a violent attack on a prominent dissident lawyer involved in a string of anti-China demonstrations. Le Quoc Quan, who blogs on a range of sensitive topics including civil rights, political pluralism and religious freedom, told AFP he was struck with a steel baton near his Hanoi home on Sunday. “I was hit three times on my knee, my thigh and my back… I think the police are behind the attack,” he said, adding that he believed the incident was meant to discourage his activism in the one-party communist state. There was no immediate comment from the Vietnamese authorities. Quan, a Catholic in the majority Buddhist nation, was jailed for three months in 2007 for participating in “activities to overthrow the people’s government” but was released following protests from the United States. In addition to his blogs, he was heavily involved in a string of anti-China demonstrations last year over Beijing’s territorial claims in the South China Sea. 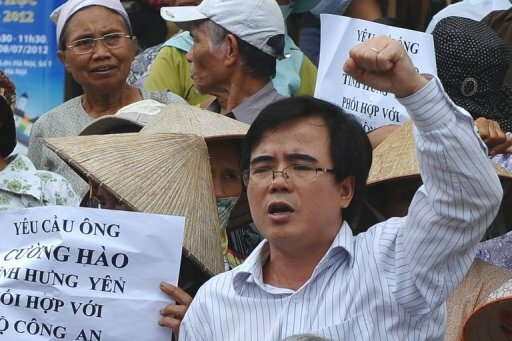 Vietnamese lawyers, bloggers and activists are regularly subject to arbitrary arrest and detention, according to New York-based Human Rights Watch, which said Quan was being targeted for his work. “Le Quoc Quan has continuously sought to use his legal skills to represent those being persecuted for asserting their rights, and now he’s become a target,” HRW deputy director Phil Robertson told AFP. Thank you for helping to bring such injustices to the attention of people, like me, who would otherwise be unaware.